The LaMotte Alkalinity test is the only titration alkalinity test we have found that gives a color chart with a starting point color, end point, and a past end point color. Most tests will show you the start and finish colors you should obtain. There is always a lot of question if the titration has gone too far which LaMotte has a supplied solution for by showing a past end point color which leads to very consistent results. Lab-quality testing kit. LaMotte produces high quality test kits and is amongst the most trusted names in testing across any industry. Unique reagent tabs and contamination resistant liquid reagent result in easy to read, trustworthy results. 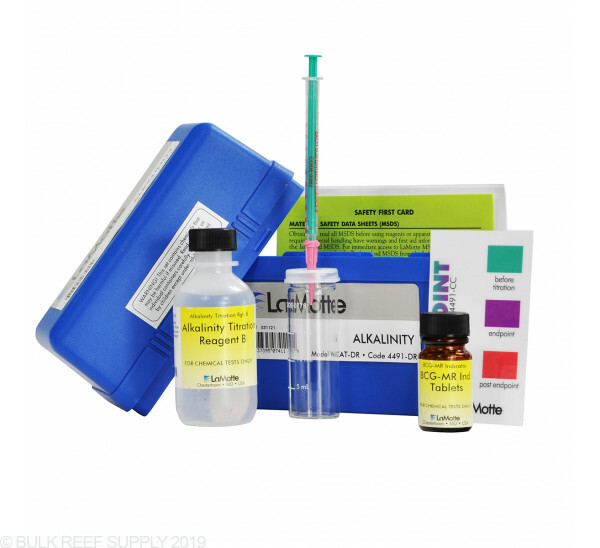 The LaMotte Alkalinity test kit includes 50 tests. LaMotte Alkalinity Kits use titrations with standard acid to the phenolphthalein (P) and/or total (T) alkalinity endpoint. Where hydroxyl (OH) alkalinity is determined directly, the sample is pretreated with barium to precipitate carbonates. All results are expressed as CaCO3. Very easy to read as stated. I have slowly moved from other test kits to LaMotte's as they other kits were used up. They may be more expensive but for me they are worth it. I now have 4 of their kits and will be ordering the Ca test kit on my next order. I've tried a number of alkalinity test kits (hanna checker, red sea pro, saliferite) and this is definitely my favorites. The titration color changes are easier to distinguish and I've been getting consistent results across the board using this test kit. Word of advice though, be sure to check and replace reagents when they reach their expiration date. I kept using mine for about a year after they expired and noticed that they slowly start to give me lower results. When I replaced reagents and compared the old reagents were giving me consistently lower results than the new reagents. This test kit is so easy to use . There is a start point color , end point color and a you have gone too far color. There is also a pill instead of drops for the first color change . Refills are also very affordable. This is the easiest to read test kit I've ever used (having also tried API, Salifert and Red Sea). My first time with Lamotte and I will certainly be trying the other kits they have to offer. Compared to the other kits it is expensive but after the initial purchase refill kits are about the same as the rest. Accurate and easy to use. Comes in a plastic case with foam inserts as compared to a cardboard box and a ziplock. I used to own this product awhile back and I am really glad to see BRS carrying it. 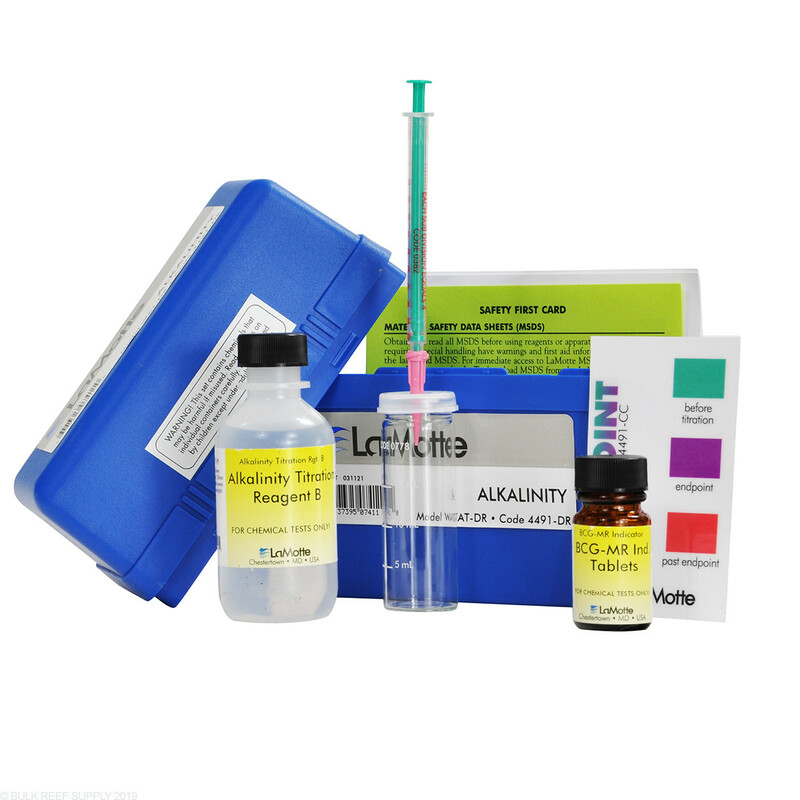 It is leagues above other alkalinity test kits in terms of its quality, consistency, and ease of use. One thing that makes this test so easy to use, is that the dispensing syringe inserts into the testing chamber and you can easily swirl the testing sample as you continue to add reagent. The number of tests you can run of course varies with your total alkalinity (as with any titration kit), but it is very generous. You will not be disappointed with this kit. 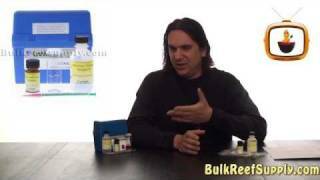 What is the claimed accuracy of the LaMotte Alkalinity Test Kit? The accuracy range of this test kit is 4ppm. The syringe the comes in this test kit goes up to 200ppm but you can refill your syringe and test up to 300 ppm. Have a great day!